Was Volvo’s announcement about going 100 per cent electric nothing more than good PR? The petrol engine will still have a role to play in the future of motoring, says Loughborough University’s Jim Saker. The announcement from Volvo that all of its new models from 2019 will include an element of electric vehicle technology was a PR coup for the Swedish car maker. It received a disproportionate amount of attention as the “first major car company” to switch to all-electric. But the statement by their CEO Hakan Samuelson that this “marks the end of the solely combustion engine powered car”, is more a reflection of Volvo’s position in the market than any justification of a global change. Volvo, known for decades for its safety, has fallen behind other manufacturers when it comes to environmental credentials. It recently introduced hybrid versions of the XC90, XC60, S90 and V90. But let’s not forget that Toyota introduced the mass-produced hybrid, its Prius, worldwide in the year 2000. Toyota now have around 80 per cent of the global market for hybrid vehicles. The question we should be asking is why Toyota or any of the other mainstream manufacturers have not come out with the same proposition to end the role of solely combustion engine powered cars? The answer lies in the fact that the major part of Volvo’s sales take place in Europe, the US and China. These markets have the potential to have the basic infrastructure in place that’s needed to support the electrification of vehicles. Other manufacturers have a more global perspective and appreciate that in parts of the world such as Africa and parts of South America the idea of a regular supply of electricity for basic needs is of more pressing concern than the facility to plug in an electric vehicle. To some extent this position is really an admission that Volvo has limited expansion plans in developing markets and is happy to concentrate in its more established countries. A cynic might also suggest that the move helps the company meet the new more stringent EU emissions targets that are due to be introduced over the next few years. Hybrid vehicles, by their very nature, require two power sources. One is a small, usually petrol-fuelled engine that charges the battery that drives the car. There are also more sophisticated developments that involve charging the battery while the car brakes but these are usually supplementary to the main form of electricity generation. Volvo’s claim gives the impression that petrol engines are a thing of the past when, with the current technology, they are still a critical part in the hybrid system. For car companies there is at least one major issue with a truly and entirely electric future. This prospect would mean that for the first time it would be those providing the infrastructure that would dictate what was happening in the motor industry. Volvo’s announcement also steals the show from perhaps the most interesting discussion about the future of cars. That’s whether or not hydrogen-powered vehicles will dominate the market – either as part of a hybrid system or as a fully hydrogen-powered fuel cell engine. Electric vehicles work well when the driver can charge the vehicle on a regular and convenient basis, usually overnight. This is fine if you have a driveway and a power source available. If, however, you live in a block of flats or in a terraced property there is a major issue. Battery life and access to a charging point add barriers in potential customers’ minds over the purchase of an electric vehicle. 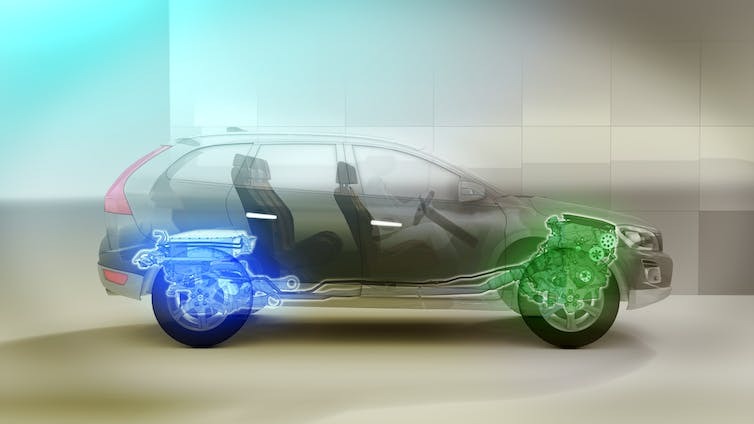 This makes the hybrid alternative a much more attractive proposition for all the major manufacturers who have or are in the process of developing hybrid models. Volvo’s announcement also steals the show from perhaps the most interesting discussion about the future of cars. That’s whether or not hydrogen-powered vehicles will dominate the market – either as part of a hybrid system or as a fully hydrogen-powered fuel cell engine. There is only the Toyota Mirai available in a few developed markets and only 3,000 have been sold globally. The reason: a serious shortage of refuelling stations. The emissions from these vehicles is water and they are claimed to be environmentally neutral. Toyota and Hyundai have made major advances in this area but face the bigger problem of building the infrastructure to refuel hydrogen-powered cars. The installation of refuelling stations would require significant investment. So, despite Volvo’s claims, the future of motoring will undoubtedly still include a petrol engine in some format in the immediate future. The only way that this is likely to change is if governments divert their infrastructure spending away from rail into opening up greener alternatives for drivers. This would improve the environment while still allowing the mobility that a car gives to people in everyday use. Even with car ownership declining in some cities, something will have to power the buses and taxis – and the cleaner that can be, the better for all. Jim Saker is Director of the Centre for Automotive Management at School of Business and Economics, Loughborough University. This article was originally published on The Conversation.